Whisk the marinade ingredients together in a small mixing bowl. And the tempeh and let marinate for an hour. When the hour is almost up, preheat a large pan over medium heat. Saute the red bell pepper and onion in the oil for 7 to 10 minutes, until the onion is translucent. Add garlic and spices and sate another 3 minutes. Frain the marinated tempeh and add it to the pan. Turn the heat up to medium hight and cook for about 15 minutes, stirring often. In the meantime, preheat the oven to 400°F and start preparing you puff pastries. Pout a little olive oil into a cup and brush a large baking sheet with olive oil. Cut each pastry sheet into nine squares and set them on the baking sheet at least an inch apart. Brush the tops of the pastries with olive oil. When the tempeh is ready, taste for salt and remove from heat. Top each pastry right in the middle with a heaping tablespoon of tempeh. Bake for 18 to 20 minutes, until the pastries are nice and puffed. Serve ASAP. Ever since I got Isa’s Vegan Brunch, I have been itching to make the Tofu Benny. Just looking at the picture in the book makes me hungry. This was the recipe that I wanted to post for the first day of VeganMoFo III, but I couldn’t find Black salt (Kala Namak) for the life of me. I finally caved in and ordered it on Amazon, and actually received it pretty quickly. I guess you could say that I have procrastinated writing this entry because I actually made it a few weeks ago. Bad Monkey, Bad!!! I marinaded the tofu overnight, so that the flavors had more time to develop. When I opened the marinated tofu in the morning, it completely smelled like eggs. I would attribute this to the use of black salt because the sulfuric smell added that extra goodness to the tofu. If you make the recipe you really need to use black salt to bring it all together. I think the marinade for the tofu would work great with a tofu scramble so that you can get the same flavor profile as eggs. When everything was ready, I plated it and then sat down for brunch. This was fantastic. The tofu totally had a flavor reminiscent of eggs. Everything worked perfectly together. This weeks Tuesdays with Dorie was chosen by Erin of Prudence Pennywise. She chose Dorie’s Sweet Potato Biscuits which are located on page 26 in Baking: From My Home to Yours. All last week, I kept thinking if making these pumpkin would be okay. Then I strolled on over to the comments section and somebody asked the question I was thinking, and Laurie actually came back with what to do via Dorie. I ended up making these late last night. Yay, for procrastination baking. If you want to make the recipe pumpkin you have to add the following to the recipe: 2 tbsp flour, 2 tbsp granulated sugar, and 3/4 – 1 cup pumpkin puree. I also decided to up the spices and I added a pinch of the following: ground ginger, nutmeg, cinnamon, and cloves. The spices added a hint of that pumpkin spice flavor in the background. Finally, to make these vegan I just substituted 6 tbsp of Earth Balance Vegan Buttery Sticks for the 6 tbsp of unsalted butter. These turned out GREAT. I heated a few up in the microwave :SHOCK: and added some spread to them this morning for breakfast. I have to say that mine were not as flakey as others, but I would be to blame on that front. I man handled the dough 🙂 But as biscuits go, I would more than likely make these again if I had some extra pumpkin on hand. This weeks Tuesdays with Dorie is brought to you by Kayte of Grandma’s Kitchen Table. She chose Dorie’s Allspice Muffins which are located on pages 16-17 in Baking: From My Home to Yours. I was really looking forward to making this recipe and then I tasted a Vegan Apple Struesel Muffin at Ellwood’s Coffee, and it was fantastic. I knew at that moment that I was going to try to recreate the muffin using Dorie’s recipe. I also chose the vegan options because this month is Vegan Month of Food (VeganMoFo). To make this recipe vegan I substituted canola oil for the butter in the batter, used Ener-G Egg Replacer for the eggs, and Earth Balance Vegan Buttery Sticks for the crumb topping. I also added one Granny Smith apple, peeled, cored, and diced to the batter. I thought that these muffins would be a little bit better with some cinnamon added to the batter. However, I decided not to add it to the batter since the title dictates that these be allspice muffins, so I refrained. The final product was very moist and yummy. I recently purchased the High Omega-3 Veganaise at Ellwood Thompson’s Market because I have wanted to try vegan mayo for awhile. OH MY!!! I was totally shocked. Not only does it taste better than regular mayo, but since it has Omega-3 s in it it is helping lower my cholesterol. This stuff is fantastic. I am so glad I purchased it on a whim. I am a total convert. I didn’t think these bad boys were going to happen because I wasn’t sure if cranberries were in season in my area yet. But lo and behold while wandering through the grocery store I spotted the fresh berries. At that moment, I knew that I would be eating these the next morning. As I sit here writing this entry, I am actually eating these fantastic pumpkin pancakes with POM-Ginger Cranberry Sauce. The sauce goes perfectly with the pancakes. It is like a celebration of fall in my mouth. Pumpkin, spices, tart cranberries, and a hint of sweetness. Perfect 🙂 Both of these recipes are from Vegan Brunch by Isa Chandra Moskowitz; however, I did tweak the Cranberry Sauce a little. Since I recently received a case of Pomegranate juice from POM Wonderful, I decided to incorporate the juice into the cranberry sauce for a little bit more tartness. I substituted half of the juice for the water and it worked out perfectly. Also, I discovered I was out of fresh ginger so I used 1/2 tsp of ground ginger. I never thought I was a fan of Pomegranate juice but once I tasted it it reminded me of a mixture of cranberry juice because of the tartness and grape juice because of the sweetness. I guess I am a convert now. An extra added bonus is that it can help lower LDL (bad cholesterol), which I am currently trying to do at age 27. Damn genetics and its fury little hands. Mix together cranberries, juice, water, sugar, and ground ginger in a sauce pan. Cover and bring to a boil. Lower the heat a bit and let simmer for about 10 minutes. Uncover and let simmer until mixture is reduced by about half, 10 minutes or so. Remove from heat and let cool for at least half an hour and stir in maple syrup. Serve warm. 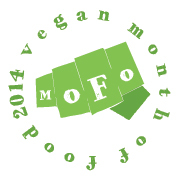 VeganMoFo III is upon us. If you have no idea what I am talking about, then you need to get with the program. Well, not really 🙂 VeganMoFo stands for Vegan Month of Food. It is that one time of year that all vegans and omnis can get together on their blogs or where ever and post about vegan food, products, and pretty much anything you want to that is vegan. It is a joyous month in my omni life where I experiment with vegan cooking and/or eating more often than I would the rest of the year. Please excuse the poor quality photos. I was taking them with my phone. First up is the Green Pig. It consists of spicy guacamole, tempeh bacon, organic tomatoes and organic sprouts wrapped up in a tomato tortilla with a side of fresh fruit. When I ordered this I was asked if I wanted it warmed. I asked the barista what he prefers and he said warm, and he was spot on. The tempeh bacon tastes just like the one in Vegan with a Vengence, but sometimes the smokiness was a little too much. The way I solved that was to flip the wrap over so that I tasted the guacamole first, because who doesn’t like GUAC! Next up, the Thai Tofu Wrap. I totally burned myself eating the one. A carrot shot out and got me in the hand. This wrap I also had warmed and is filled with baked tofu with julienned vegetables and peanut sauce. I actually really enjoyed this wrap also which is funny because I hate cooked carrots with a passion and it was perfect. Last but certainly not least, the TON OF FUN. I am completely one of those people that just ordered this because I loved the name. The Ton of Fun consists of mixed green lettuce, hummus, cucumbers, tomatoes, and sprouts wrapped up nicely in a tomato tortilla with a side of fresh fruit. This was the first wrap that I ever had at Ellwood’s and it was yummy.